“Galway City Council is constructing a multi-modular ramp to provide safe access from the Dyke Road to the Quincentennial Bridge. Funding from the National Roads Authority has facilitated this work. A number of archaeological finds have been made and an archaeological company has been engaged to investigate these finds. Moore Group has been engaged along with an Osteo-archaeologist, Linda Lynch, at the site where at least six burials have been discovered. A number of other possible grave-cuts, pits and features have also been found. A row of three nails which possibly formed a line of coffin nails suggest that the burials are of late medieval or post-medieval date. Some 17th century pottery, window glass, clay pipe stems and possible glazed oven brick have also been recovered from the same general level as the burials. Apart from these a knife, a buckle and other finds have been made from disturbed contexts. An interesting range of prehistoric stone lithics or tools made from chert and flint have also been recovered. These fascinating finds have a possible date range from the Late Mesolithic (Middle Stone Age) through the neolithic (New Stone Age) and perhaps as late as the Early Bronze Age. These include a characteristic Hollow Scraper tool of Neolithic type. The finds have been made in the same field as Terryland Castle. There was a Castle here at a fording point in the river Corrib from the 16th Century onwards. There was another castle on the opposite side of the ford at Newcastle, parts of which also survive. The present Castle at Terryland however is really a later Fortified House of early 17th century date which was the property of the Earls of Clanricard, descendants of the De Burgos who came to Galway in the 13th century. Terryland Castle was garrisoned during the rebellion of 1641 and again during the Cromwellian Wars in 1652. It was occupied by a joint force of Irish and French troops who defended the outworks of the Castle against the approaching Williamite Army in 1691. After a short defence and a skirmish during which several people were killed the Irish and French burnt the castle and retreated into the walled town of Galway. Later, a house – Terryland House – was constructed nearby and its ruins are visible nearby. There is speculation that the burials might relate to one of the 17th century wars mentioned above or that they form part of a private burial ground for the owners of the Castle and estate. More details will emerge as the excavation proceeds and an account of the excavation and its finds will be published as soon as possible. This entry was posted on Monday, February 25th, 2013 at 12:44 pm. It is filed under About Archaeology, News and tagged with archaeology, galway, Terryland Castle. You can follow any responses to this entry through the RSS 2.0 feed. From around 1975 to 1978, My family rented the house at 23 University road (I think, it might have been Number 22. anyway there are 2 houses side by side along the canal there opposite the University (UCG as it was then) The girl next door, Barbara Geraghty (whose family owned both houses) had a yellow fibreglass canoe. During the summer months she and I used to paddle up the river in the canoe,in which we filled with camping gear, to Terryland Castle and camp for days on end. We used to land on a small beach of sand and rock and pitch our tent next to the river near the castle. It was so small and isolated and was a wonderful way to spend teenage years. We used to joke that it was my castle as my name is Terry, nickname for Teresa. There were cows in the field adjacent to the ruins and one day the landowner found us there. We thought we were in trouble for camping in his field… He came over to us and asked if we had lost a bet or something… we said no, that we were there for the pleasure of camping out… he assured us that “the Mrs. had a guest room that we were welcome to sleep at the house if we wanted. We said no thank you as we were more than happy to camp. I’m sure he did not know what to make of us, whether to feel sorry for us or to think we were both crazy. He came by in the mornings with fresh milk, still warm from milking. They were wonderful days. It was our secret place no one else knew ,where we could go and be at peace and quiet. 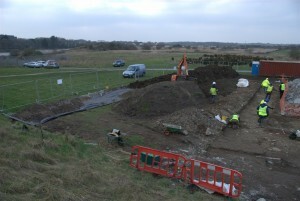 Thanks for your comment Terry – It’s amazing to think of the site as being so isolated..